E. J. Sullivan and G. García Márquez, Tomás Sánchez, Milan, 2003, p.170, no. 141 (illustrated in color). I. O. Rey, ed. Tomás Sánchez: Paintings, Coral Gables, 1996, (illustrated in color). Sánchez, who claims affinities with the artists of the Hudson River School and also with the Romantic Caspar David Friedrich, however differs--they were Transcendentalists; he does not merely contemplate nature but is within its realm. He credits his exercises in meditation and yoga as significant factors in his spiritual growth. Through his practice of Siddha Yoga, he has communed with a consciousness--in union with the universe and credits the lessons learned under meditation with allowing him to feel a complete state of fulfillment. The quasi-surrealist paintings of trash sites are urban landscapes and as his vast panoramas of lush forests or still waters by a placid lakes--are contemplative reflections about the human condition and nature. 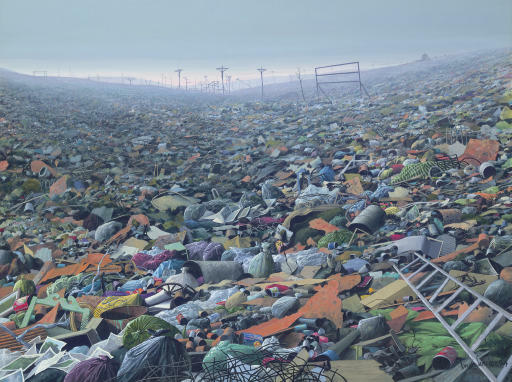 Al sur del Calvario, 1994, is filled with the trash of contemporary materials--the objects we are content to devour when new and discard when they have ceased to interest us. It is the thrill of the new that fascinates this post modernist consumerist society. What appear to be three crosses in the horizon of the painting refer to a crucifixion more than 2000 years ago. Sánchez has often expressed his own concerns about the planet and the destruction of the ecological systems in his many basureros, as these works are known. In viewing these sublime works, we come face to face with destruction but also with a reality that is palpable yet also full of hope. The crosses stand as a symbol of salvation. 1) E. J. Sullivan, Tomás Sánchez, Skira, Milan, 2003, p. 18. Please note this lot is sold with a photo certificate signed by the artist and dated October 11, 2007.